With a couple of simple tweaks, everyday chops and peas can be taken to another level. 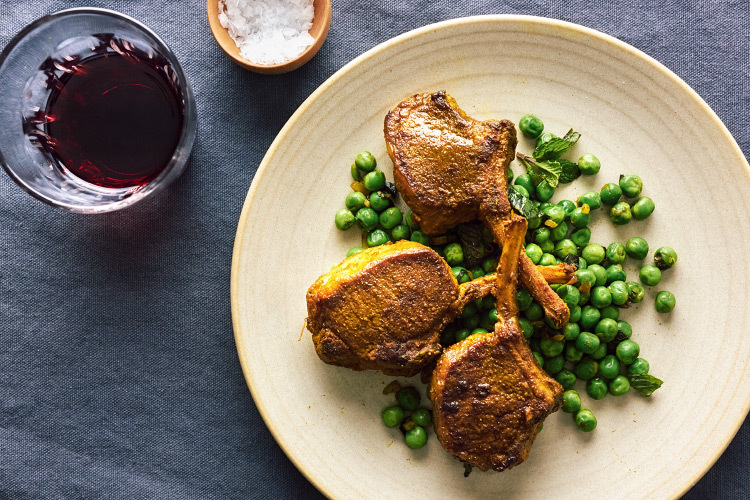 With a couple of simple tweaks, everyday chops and peas can be taken to another level. At the heart of the transformation is the warm intrigue of North African ras el hanout – the storied “top of the shop” spice mix – and turmeric’s earthy Midas touch. Together they create sensational colour, aroma and flavour. The peas, meanwhile, benefit from a hit of their traditional partner, mint. You use one pan and it all happens in 10 minutes – what’s not to love? Make the lamb cutlets a little thinner by putting them under a piece of cling film and giving them a couple of flattening whacks with a rolling pin (or any other heavy, unbreakable object you have to hand). Place the cutlets in a plastic bag and measure in the ras el hanout, turmeric and salt. Close the bag and shake it until the lamb is completely coated in the spices. Warm the olive oil over medium-high heat in a frying pan large enough to accommodate all the cutlets in a single layer. Fry them for 3 minutes a side and transfer to a sheet of foil, wrapping them in a baggy but tightly-sealed packet. Sauté the shallot in the same pan until it softens, then add the peas, cooking just until they are tender – about 3 minutes. Still on the heat, mash them lightly with a fork and, off the heat, stir through the chopped mint. Spoon the peas into the middle of two waiting plates, unwrap the lamb and place on top of the peas.